One thing that was clear to Michigan State's offensive staff was that Michigan was bad at containing the edge on running plays. When Michigan's defensive ends weren't being chopped down as they recklessly rushed upfield, MSU was using a variety of blocking schemes to seal Michigan's linemen and linebackers to the inside of the field. One such play would've gone for a touchdown had Edwin Baker not gotten a case of the fumblies. It's the first play of MSU's second drive of the third quarter. MSU is in an offset I formation with one wide receiver and an H-back. Michigan is in a 4-3 even front with SAM linebacker Jake Ryan rolled up to the line of scrimmage as the EMLOS. 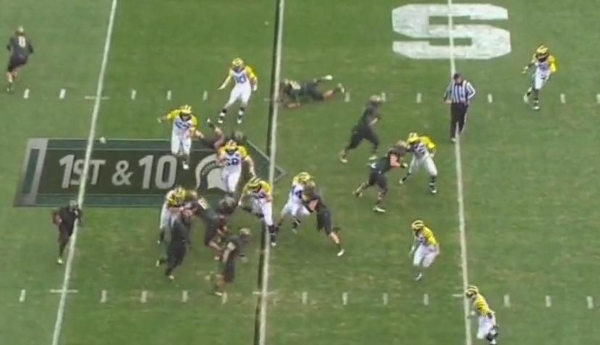 Before the snap, MSU's H-back will motion across the formation. Michigan doesn't change their formation at all. This is a problem because, if you can count, you can see that on the strongside of the field now (bottom of screen), Michigan has only five defenders. 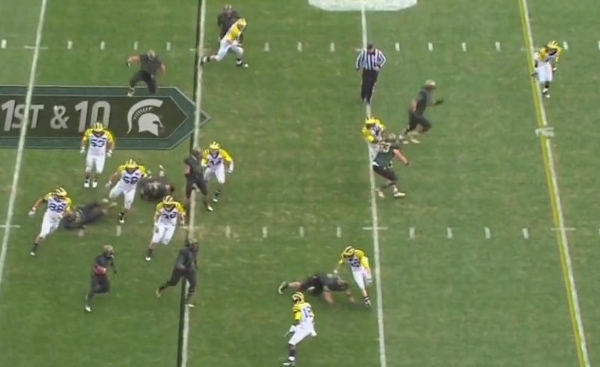 Meanwhile, MSU has the RG, RT, H-back, FB, and wide receiver on that side of the field to block. As the ball is snapped, the RT immediately steps away from the line of scrimmage and pulls around to the playside. The fullback is also headed to the strongside of the field as a lead blocker. The H-back and wide receiver are tasked with sealing Craig Roh and Desmond Morgan to the inside of the field. The right guard will reach block and seal Will Heininger. This is an outside pitch to Baker. A moment later, the WR and H-back have effectively sealed Michigan's defenders and Heininger is also being sealed to the inside. The right tackle and fullback are pulling around the formation as lead blockers. 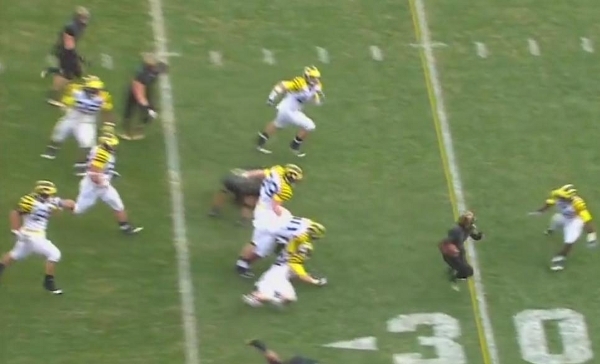 Michigan only has two unblocked defenders left on that side of the field. Doom cometh. Baker has blockers and the ball. The fullback chops down Kovacs. The right tackle is headed directly for Countess. Thomas Gordon, who just entered the screen, stands as the last defender between Baker and an 80-yard touchdown. Gordon takes an awful angle, allowing Baker to get to the outside. He will lunge at Baker and force a miraculous fumble. I don't know what to do here, honestly. MSU has an overwhelming numbers advantage to the playside after a pre-snap shift but Michigan's defense doesn't make any adjustments. I think realistically, once MSU motions the H-back across the formation, the defensive line has to shift as well. Ryan likely has to put his hand in the ground and Roh becomes the EMLOS. That might not be a sound defense, however. Anyone with insight, feel free to let me know in the comments. Though it's not a surprise, this is a clear indication that MSU's coaching staff knew that Michigan's defense was weak on the edge and utilized some unique blocking schemes to help get outside. Rather than using their wide receivers to block safeties downfield, they were assigned to Michigan's linebackers, giving the running back one-on-one matchups against Michigan's safeties downfield. 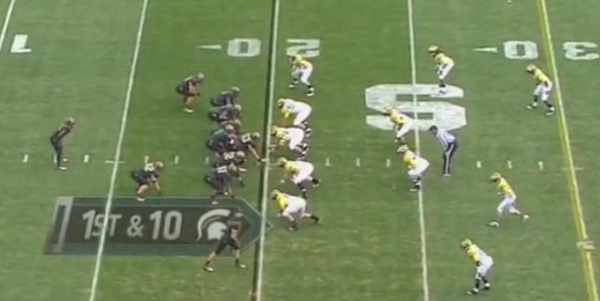 Part of the problem is that Michigan is in a cover-3 formation against a likely running formation. The other problem was Michigan's backside defenders not pursuing the ball quickly enough (if Morgan had managed to force this play back inside, would Michigan have any defenders there to make the tackle?). Michigan was bailed out by a lucky forced fumble, but unless Michigan's defense reacts to these pre-snap shifts, expect more teams to utilize these tactics.